Time is ticking on and Reg is getting itchy wheels to go on a new adventure. Still can’t leave the UK as waiting on a Driver’s Licence renewal to arrive from Australia; about a 3-week turnaround. Once this arrives, an application for an International Driver’s Permit has to be sent; another 2-week turnaround from the UK to Australia. Both my renewal and permit are finished and I have them in my hot little hand. So, whilst waiting, decided to go on a road trip to test Reg again after his big initial service at the hospital. Once the licences arrive, the rough plan starts with the ferry across from Portsmouth to St Malo (France), we then have to be in Spain for our good friend’s 50th birthday in October. But as we’re already in September, at this rate we’ll never get there for the party. The pretty drive from Street (Somerset), takes about two and a half hours to Bude; decided to break up the journey to Penzance. Having first visited Cornwall in 1985 and then again 2009, I was really looking forward to another visit. I’ve always loved Cornwall for it’s rugged cliffs, gorgeous long beaches, windswept scenery, quaint cove villages, lovely locals with devilish accents, and scrumptious heart-attack food. Excellent facilities in this lovely campsite. 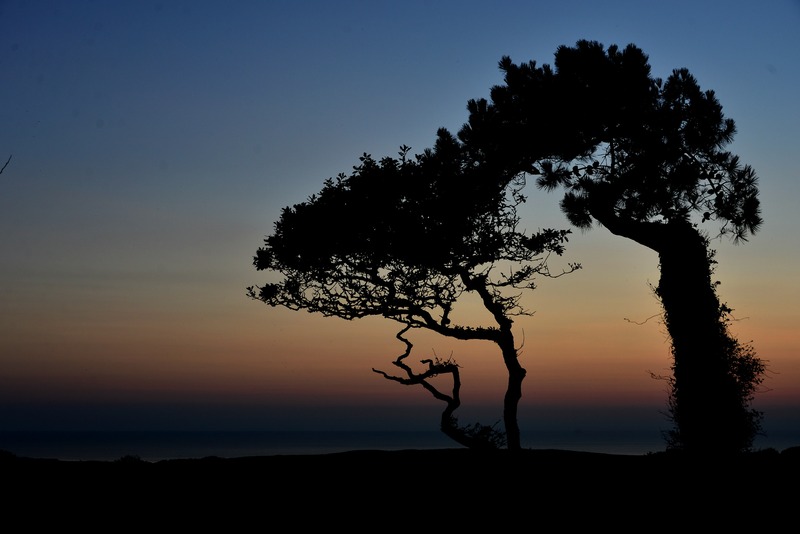 Hedges are planted between most pitches so you have more privacy than the – (although Freshwater Beach Holiday Park is a much more open-spaced site). This site offers a Takeaway, Bar & Grill (great delicious food at reasonable prices), kid’s play area, indoor swimming pool, and more. You can play a spot of golf (£2/person) in a 9-hole course or for those in need of a workout, there is a good little gym on site at £3/hour. If you love walking, then there are many signed nature walks close to the campsite amongst other walking trails and also dog-walking areas. From the campsite, it’s about 2 miles into Bude so a good walk but great to stretch the legs after sitting in Reg. If you don’t feel like walking, then a bus does leave from the front of the campsite, you just need to check times at Reception. A lovely quaint seaside resort town with loads of walks along the seafront, beach, and also canal. Many restaurants, coffee shops, ice-cream stops, an adventure obstacle course, a golf course, the Bude Castle (free entry), and photo opportunities to keep you busy for a while. 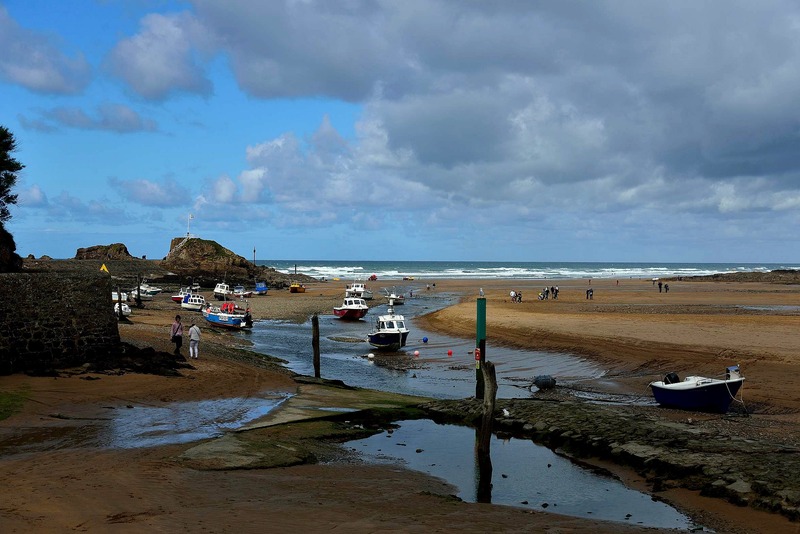 Visited Bude a couple of times, during high season (September) and low season (October). The town has a more relaxed feel to it during low season although it’s still bustling with leftover tourists, pleasant just walking around the town and seaside. A delightful walk along this 18th century-built canal, which extends from the town out to sea, is a great photo opportunity. 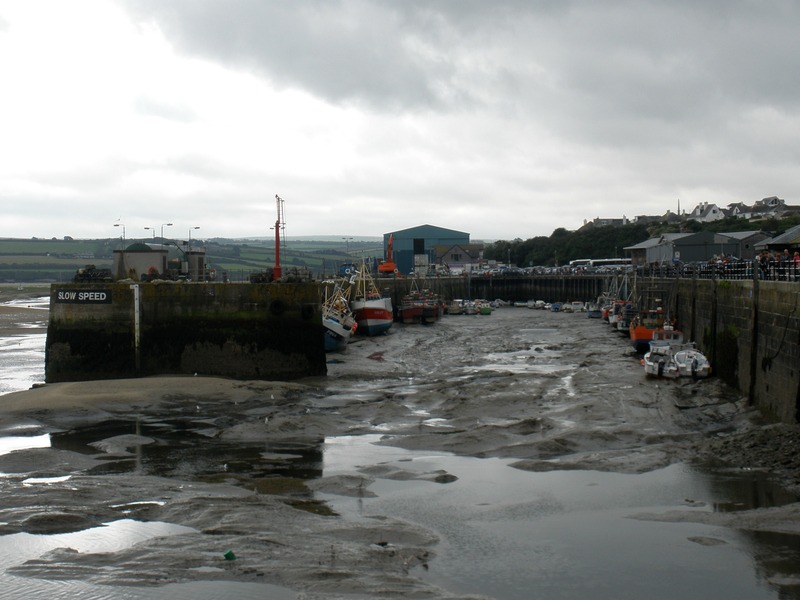 The Bude Canal Company built the canal to improve the harbour as back then, only a small unprotected tidal harbour existed and it was difficult whenever the sea was up. The Castle Bude – Although not as old as other castles in the United Kingdom, Sir Goldsworthy Gurney built this (his home) in 1830 on sand and contrary to locals’ prediction at the time, the castle still stands. A testimony to this scientist and inventor’s brilliance, he also invented the Bude light. Learn all about this incredible gentleman in the castle’s Heritage Centre, which is free entry. A small shop with unusual handmade local sea jewellery is available on site as is the Café Limelight, which I’ve mentioned below. Café Limelight – After the overnight stay at Wooda and as checkout is at 10:30, decided to stop in Bude again for Cream Teas at the The Castle Bude. Wonderful home baked fluffy scones with jam served with the famous clotted Cornish cream. The cream is so thick that you can stick your spoon in it and hold the container up. Mmm…very luscious and an assured way of hardening the arteries. This café seems to be the best and cheapest in Bude; both quality and service are excellent. The view looks over the expansive seafront, so it’s easy to spend hours here just relaxing before the drive back. Preston Gate Inn (Poughill) – An easy walk downhill from the campsite and you’ll bump into this lovely quaint pub with friendly owners Dani and Paul, serving up fine local beers and ales with a friendly welcoming feel. Make sure you stay for their wonderful home cooked scrumptious delicious Cornish food and deserts at reasonable prices. The menu changes daily but if it’s on offer, try the Steak & Ale pie, it’s the best I’ve ever eaten. This is also a dog and child-friendly inn. Olive Tree – If you are strolling along the canal and in need of some lovely Cornish Cream Teas, then try the Olive Tree café. For £4.95, you are served two homemade scones with strawberry jam and wonderfully thick heart-clogging clotted cream. Light meals are also served and look scrumptious. A lovely atmosphere with tables and chairs outside overlooking the canal; especially wonderful when sunny. 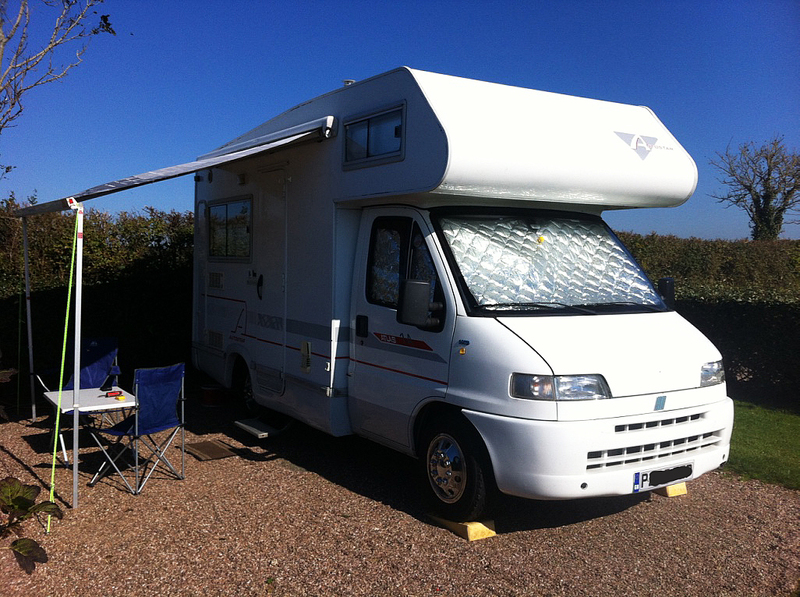 Tip: As with most of the UK (I believe), there isn’t any free parking but there is a motorhome/van parking area (£1/hour for the first four hours) near the Tourist Office in Bude so it’s nice and close to everything, and safe. 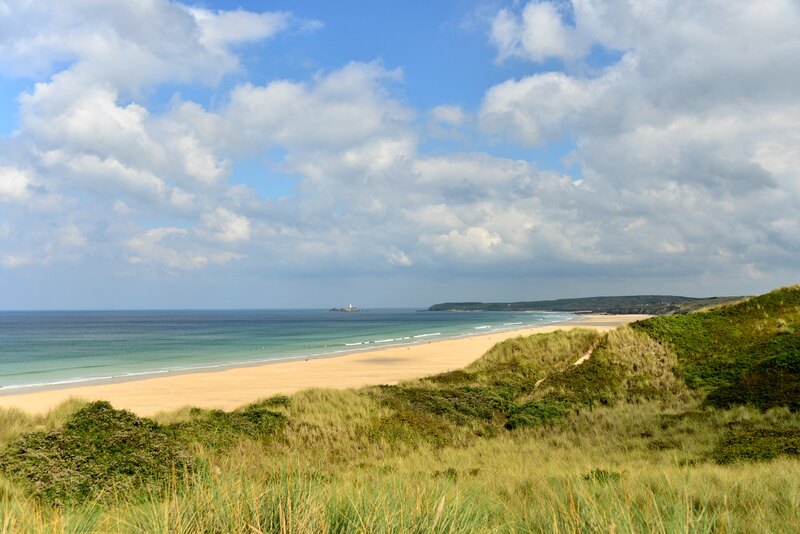 About an hour from the Wooda campsite, a drive to Padstow is always a cool way to spend a day out; and great to walk around the plethora of restaurants, Pasty bakers, and Chippy shops (Fish & Chips). Good Cod & Chips (or other seafood dishes) can be had pretty much anywhere in Padstow, but shop around as prices vary greatly. If you feel like cuing for a long while, try one of the many Rick Stein cafes or restaurants in Padstow. Pricey but apparently pretty good – he seems to own the whole town these days. If the sea is kind on the day you visit, a few companies run boat trips across the Camel Estuary to Rock and out to sea, along the rugged Cornish coastline. The Rock is on the opposite side of Padstow, so you can explore all that side has to offer. Acclaimed as one of the major water sports centres in Cornwall, sailing, windsurfing, water skiing, and canoeing are popular, and offered, weather permitting. Or just laze around on the long stretches of fine sandy beaches – a result of the estuary’s tidal waters. Drove to Penzance to catch-up with a good friend and the reason for the Cornwall trip. This town has expanded since I was first here in 1985 and last here in 2009. And understandably so, everything seems much more expensive, but perhaps it is also a problem with our Australian dollar being quite low at the moment: $1=£0.45 (ouch!). Although Penzance has become busier over the years, I still love this area for all its rugged scenery, coastal walks, gorgeous expansive beaches, pace of life, and the friendly people. 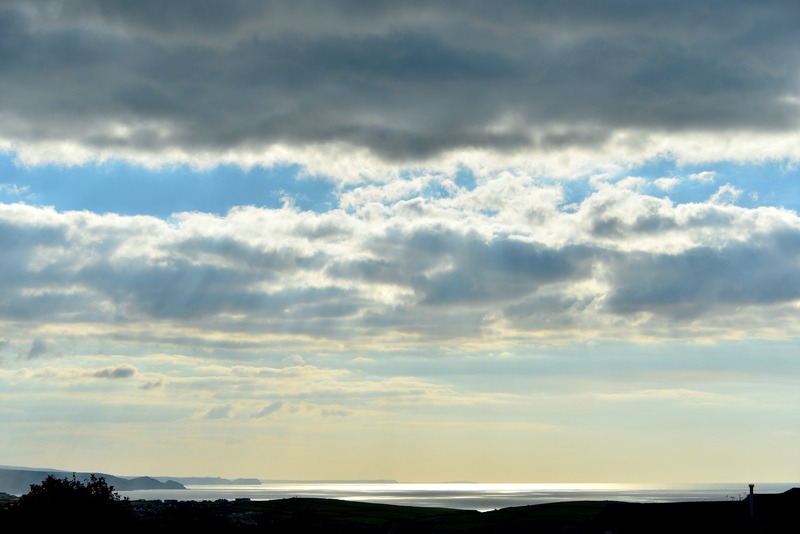 Apart from the numerous lovely coastal walks in this region and bumping into remnants of old tin mines from a bygone era, Penzance boasts several other tourist attractions. At £8 entry fee, it’s a little pricey but pleasant to walk around the 20-acre garden. The art at the gardens, whilst reading about the history and stopping for the spectacular views over Mounts Bay, make this a pleasing experience. More amazing is the fact that all the plants you’d expect in a sub-tropical rainforest, are growing right here in the UK. 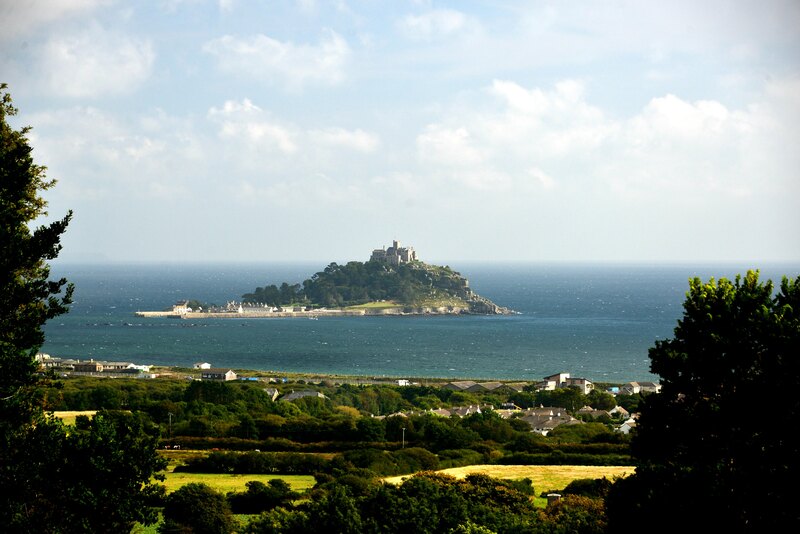 Prior to 1290, monks of St Michael’s Mount owned the land at Tremenheere. During this time, William De Tremenheere, a tenant farmer bought the land, thus carrying his name forward into history for more than 700 years. 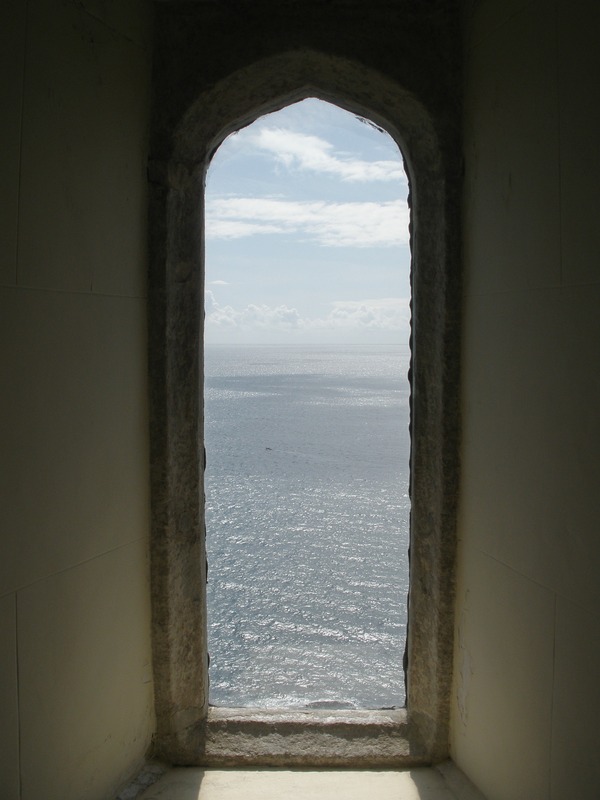 Geoffrey Chaucer’s proverb “Time and tide wait for no man” comes to mind when you visit St Michael’s Mount. This small tidal island in Mount’s Bay is connected to the mainland by a man-made causeway of granite setts (broad rectangular quarried stone), which you can walk across between mid-tide and low water. If you happen to be visiting during high tide, a small boat can take you to the Mount for a few pounds. The earliest buildings on the Mount date back to the 12th century. Apart from the increase in the entry fee, nothing much has changed from when I first visited. Happy to view the Mount from different parts of the mainland and didn’t feel a burning desire to enter on this visit. 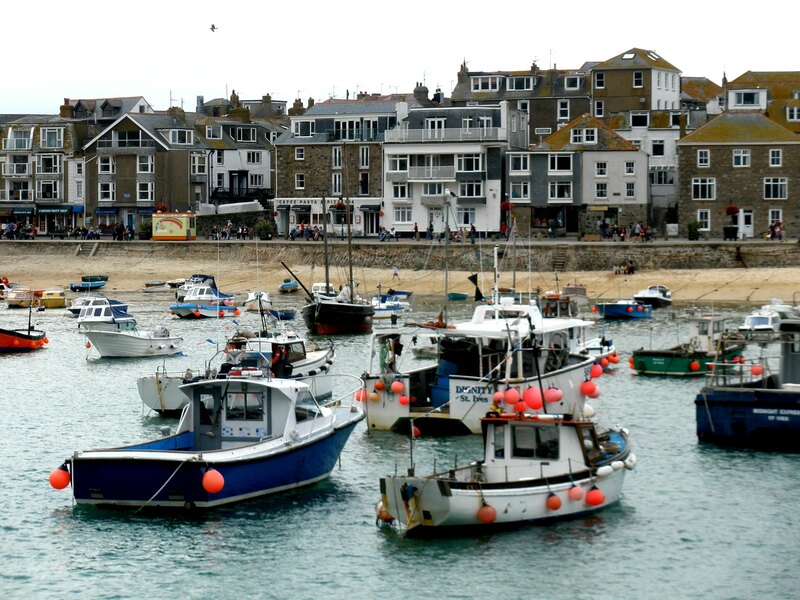 A quick twenty-minute drive from Penzance to the picturesque seaside town of St Ives is always a must. 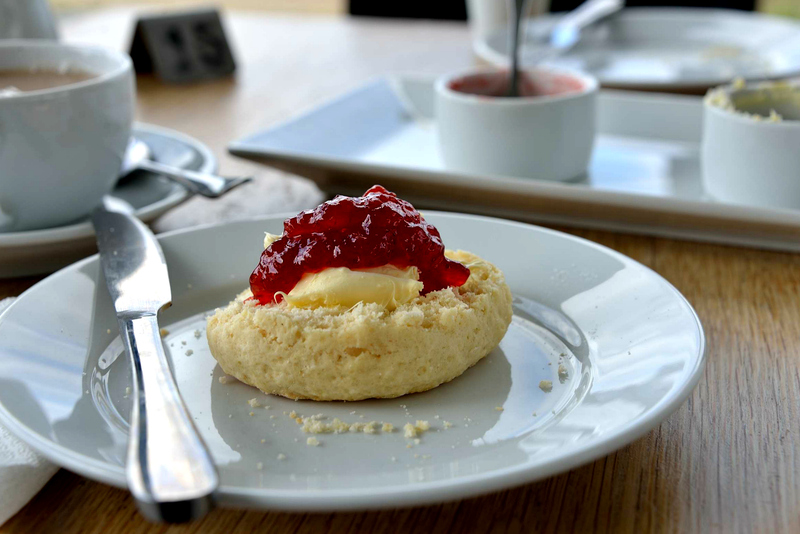 Walk along the seafront, check out the plethora of art galleries, or just wander the cobbled streets and rest at one of the many cafes for a Cornish Cream Tea. 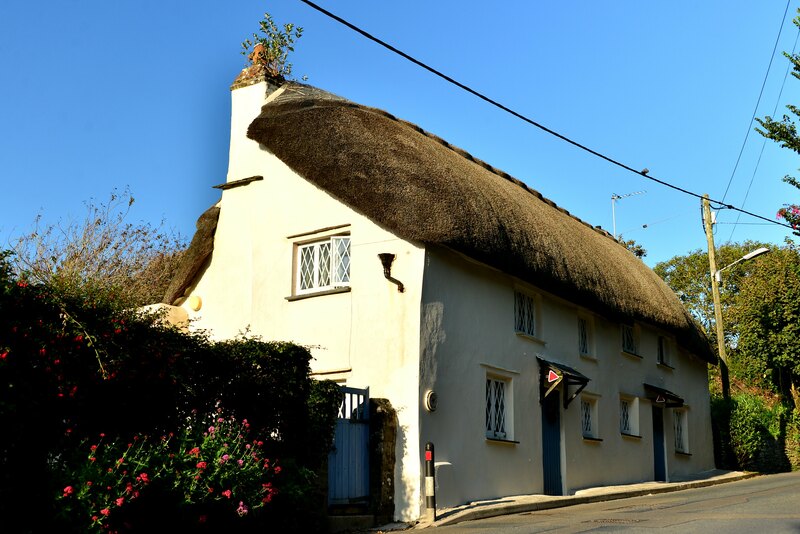 Stop in at The Sloop Inn – one of the oldest inns in Cornwall. Dating back to 1312, its been a fisherman’s pub for many centuries. Loads of good cafes and restaurants here, and seems that this town is very popular with tourists at any time of the year. Warren’s Bakery (Penzance) – Apparently the Pasties here are not supposed to be the better ones in Penzance but ate one here and it was yummy. The coffee was OK and a chocolate muffin was thrown in for good measure. Good service and pleasant surrounds. Blas Burger Works (St Ives) – Extremely busy venue (you may be told to return later as we were) and not a quiet romantic venue but a great noisy fun ambience. The burgers are very good and prices start at about £8.95, alcoholic drinks are a little pricey. The Bean Inn Vegetarian Restaurant (St Ives) – Serves delicious vegetarian and vegan meals. Service is great, deserts (Puds) are lush, and wine is sold at an average price. After a lovely few days in Penzance with good wine, food, and catching-up, sadly, it is time to leave. A drive back to Bude’s Wooda Farm Caravan Park to stay for a couple of days, before heading back to Somerset’s wet weather – it always rains in Somerset. Visit my Nilla’s Photography gallery for more images. More posts on United Kingdom. 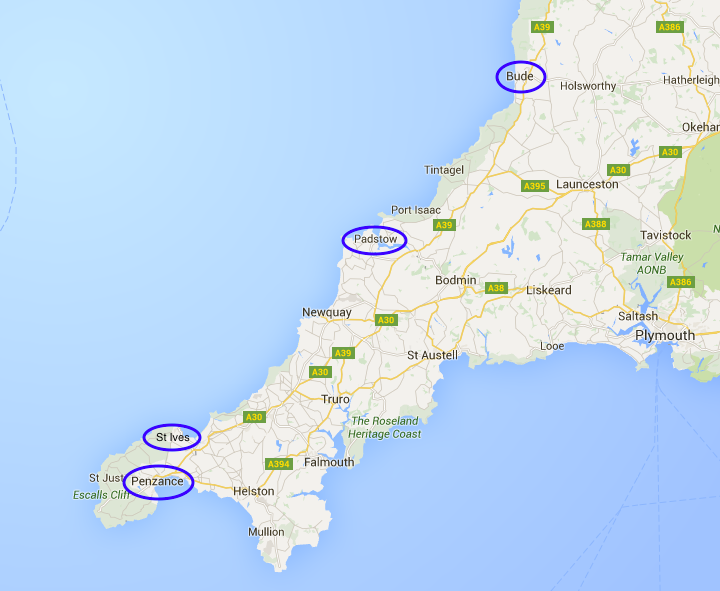 Enjoyed reading this interesting blog on Cornwall. 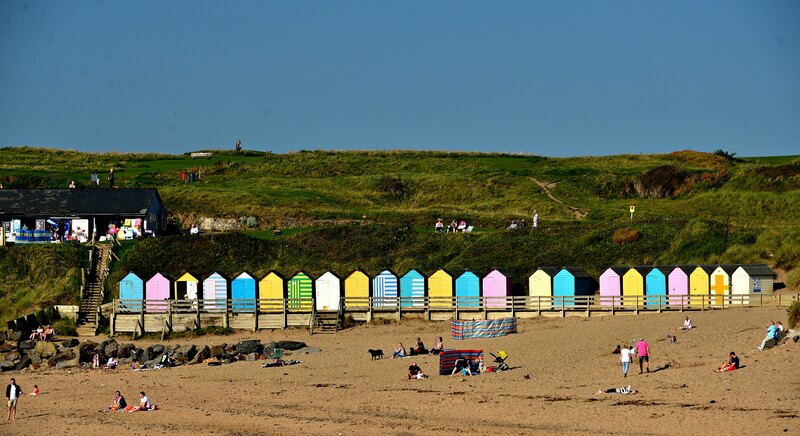 Brought back happy memories of visiting Wooda, Bude, Padstow but especially the cream teas and delicious scones. Look forward to visiting again later this year.. Excellent, I’m glad this brought back happy memories! I’m looking forward to re-visiting this area in May-June.